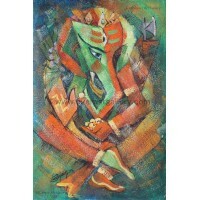 We feature a wide variety of paintings and sculptures with different themes and subjects in almost every media, style and technique done by various professional and prominent artists of Nepal. We have now a collection of artworks executed at different times and moments of inspiration by more than one hundred well-known and young artists of Nepal. Since its inception, the Gallery has been dealing with the National and International Art Galleries, Museums, Art Dealers, Art Collectors and individual art lovers. To cover a wide section of the audience from all over the world and promote the Nepalese arts and artists at the international art market, we have also initiated our gallery website. All the viewers can get the latest updates on the Gallery’s activities and events, view online art exhibitions as well as make online inquiries/purchase of artworks from the gallery’s database of the latest collection and stocks of artworks. Please go to our ONLINE STORE to make your purchase. 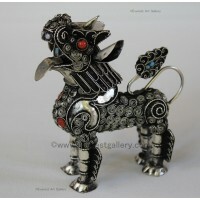 We currently sell handmade statues/sculptures, filigree product of different animal figures made of white metal and other ritual and non-ritual artefacts made of brass, silver, iron, white metal, bronze etc. Filigree is a delicate ornamental work of fine silver, gold, or other metal wires, especially lacy jewellers’ work of scrolls and arabesques. (Source: dictionary.com). Similarly Wikipedia.org defines Filigree (filagree, filigrann or filigrene) as a delicate kind of jewellery metalwork, usually of gold and silver, made with tiny beads or twisted threads, or both in combination, soldered together or to the surface of an object of the same metal and arranged in artistic motifs. This section includes Nepalese high quality handcrafted sterling silver jewellery with or without precious and semi-precious stones reflecting traditional and/or modern design. Our silver jewelleries are stamped for 925 of purity. 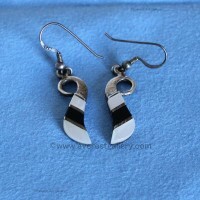 The silver jewellery item includes Ear-rings, finger rings, pendants, bangles, bracelets, and necklace. Handmade paper is made using traditional methods from the bark of Daphne Cannabina of Papyracea, locally known as ‘Lokta’ which is found at altitude of 6500 ft. (2000 to 3500 meters )in the Himalayan Region of Nepal and has characteristics of generating again after 6 to 8 years of cutting. Bark is collected with environmental awareness. This paper making process involves cooking the bark twice consecutive washing, chopping and beating with wooden hammer. The soft pulp is poured over a wooden-frame and spread evenly by gently shaking the floating frame in water and then sun dried. The making of Lokta paper continues today as a self-supporting cottage industry. Our products are made in Nepal and buying these products will support to improve the socio economic conditions of the lower strata of society in both rural and urban areas of Himalayas. Our products are made entirely tree-free and environment friendly, minimizing adverse effects on the environment. 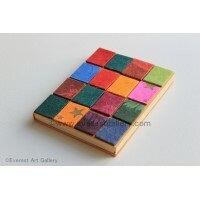 We offer you different handmade products made of Lokta Paper(Rice Paper) such as journals, note books, writing sheets, writing pads, painting papers etc. A pure felt is fabric made of wool fibers or animal hair matted together by steam and pressure without spinning, weaving or knitting. It is produced from wool, which grips and mats easily. The fibers are dyed to acquire the required colours. Dying can be done by Hand or by machine, but machine dyeing is more practical for fast colour. After completion of the colouring process, our skilled woman workers compress the raw material (Wool) by hand with the help of soap and hot water. The products are 100% handmade. While still wet, the felt is shaped into the pattern of the intended product. The shaping is done by hand without sewing or patching. Hand manipulation and rubbing in combination with the application of hot water achieve the desired shape. 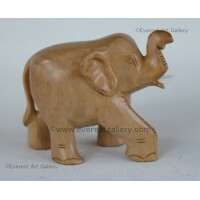 The shaped felt items are sun dried after which Final product may require gluing and/or sewing, as per the requirement. Pashmina is a term applied to the wool, and products made from the wool, derived from the undercoat of the Capra hircus goat, a domestic breed raised primarily at high elevations in Central Asia, particularly Mongolia. For years it has been used by weavers in Kashmir (hence "cashmere"), a disputed area between Pakistan and India. Wool from the same goats, but of a higher quality (a couple of microns thinner, in general) has been used to produce "pashmina" in Nepal. Only in the highlands of the Himalayas, is the softest wool found in nature. Often known as the fiber of the King, Pashmina wool was worm by Moghul Emperors & Imported for 18th century aristocrats. This Indigenous craft has managed to survive by local tradesmen who consider this regal fabric as precious as jewels. It is said to be eight times warmer than sheep wool. The Pashmina fiber is derived from the mountain goat Capra hircus (locally called CHYANGRA), which is native to the Himalayan belt, around & above 10,000 feet above sea level. The fibre also known as ‘Pasham’ is the fine inner (under) growth over which the goat has another layer of thick & coarse dead fibers. The Pashm is profusely mixed up with these dead fibers. It is hand gathered with a special comb each goat produces 3-8 ounces of wool annually. It is an extremely complicated technique to extricate pure Pasham from the beds of the coarser dead fibers into which the real fiber is deeply embedded. Unless fibers are cleaned up to 98% purity beforehand spinning, the unique texture of Pashmina doesn't emerge. Having studied the genesis of this unique natural gift to Humanity for decade the Nepalese Pashmina manufacturers have been involved with a determination to revive the heritage of Nepalese Pashmina craft with the ancient zeal. As the demand of such precious materials has increased the raw material is not available in own country, hence Chinese Pashmina yarns are depended highly to meet the demand in the exportation. Chinese white Cashmere yarn is world famous in quality & softness, which has been presently using by prestigious fabric production unit all over the world. Pashmina is so softness & hand-made product. It commonly used as shawl, scarf, blanket, bed-covers, sofa-covers & nowdays, coming up with garments like night gown for men & women, inner linings for coats & waist-coats & ladies T -shirt, skirts & many more items. 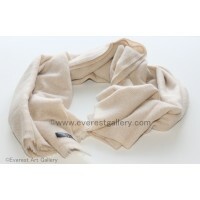 Beautiful Pashmina shawls, scarves & wraps should give a lifetime of pleasure & comfort. Cleaning Pashmina: With proper care, our Pashmina shawls, wraps & scarves will maintain their look & increase in softness long after other Pashminas wear out. Our Pashmina garments are not brushed to make them softer. Because pashmina shawls & other garments are woven entirely by hands, they are extremely delicate and could get spoilt when washing if proper care is not taken. Professional dry cleaning is the best way to clean the shawls, wraps & scarves. Cleaning them in washing machines can distort the shape & the quality of the garments. Dry Clean is the safest way to care the Pashmina. Directions for hand washing: Brush gently to remove excess fiber Hand wash in cold water with mild detergent soap or low ph hair shampoo Place on a towel and roll up to gently squeeze out excess water To dry the pashmina garment, place it on a flat surface and let it air dry. Lightly stretch & level the edges to retain its original shape. Use a soft brush width-wise to give the garment a soft and fluffy feel, lightly press with a steam iron. While brushing Pashmina, use only a very soft brush with mild and soft strokes. BEWARE - hard brushing will wear out pure Pashmina. Some more tips: People in Nepal have preserved their pashmina garments without problems for centuries, although bugs & other creatures roam in abundance. Do not store in cedar trunks or closets. It is believed certain bugs are attracted to the wood. Store in a metal container with a few cloves wrapped in muslin. Families who have worn these garments for generations believe it keeps all bugs, moths, etc away. All our products are available in Solid and Shaded colours. Our value added line includes Embroidered, beaded, pearl embroidered and beaded tassels. All the embroideries are done by hand and are very intricate. Likewise, we can also make these products in the size required by the customer. Blankets, Shawls, Stoles, Scarf, Bag, Different designs of Weaved Shawl, Shaded, beaded and Fabric by yard and other customized products. We manufacture in Cardigan, Twin Set, Collor Neck, V Neck, Key Hole Neck, Round Neck, Turtle Neck, Hi Neck etc. The designs are available in two and four ply 100% Cashmere. Contrary to popular belief, cashmere is easy to clean. Wash it in warm water with a good, natural shampoo. (We use an Aveda shampoo in our factory.) During the dyeing process, all items are kept in water between 30 to 60 minutes at a temperature just below boiling, and are washed twice more, so do not fear washing cashmere in water. Dry cleaning will cause no harm. WHAT KIND OF FRINGES DO YOUR ITEM HAVE? All our pieces have the standard three-inch long twisted and knotted fringe, unless you specify otherwise. We can also make a 3/4 inch open fringe or no fringe at all. Nature of Hand Made : It is to be understood that there can be some variation on weaving, dyeing or in finishing due the nature of hand made. Some pieces can vary even if they belong to the same category. Are our products really as good as the stuff they're selling at other store and online market? In a word: Yes. Do not be misled by fancy designer labels! Most pashmina textiles are woven by local craftsmen in Nepal; the big names are just sewn on later. Actually, some of the shawls sold by the biggest importers are machine-made: that's the only way they can assure themselves of a reliable supply, not to mention lower cost. However, there is a difference! Hand-woven cloths are tighter (therefore denser and warmer). To spot a machine-made wrap, look at the fringe base: machines make an unnaturally straight edge. We only sell textiles handcrafted by experienced weavers. I see references to "100% pashmina", as well as "70/30" and "50/50" silk blends. What's that all about? And what's a "ring shawl”? The best-selling Pashminas -- sometimes advertised as "pure" -- are really mixes of 70% wool (the crosswise "woof" thread) and 30% silk (the lengthwise "warp" thread). Some marketers try to gain a competitive advantage by claiming 75%-25% or 80%-20%, but the difference is unsubstantial. True 100% pashmina is palpably lighter and warmer than silk blends -- some people describe it as "buttery." The "ring shawl" is a full-size 100% wrap that theoretically is fine enough to pass through a ring. (Personally, I've never tried, and I have no idea whether they're referring to a man's or a woman's ring.) However, the 100% pashminas or Cashmere is not as strong as the 70%-30% mix, and they lack the sheen and the elegant drape of the silk, which some people prefer. I've seen some pashminas that are a LOT cheaper than yours. What gives? Some of the shawls and scarves being marketed as pashmina are made in India and other places, and are likely to be inferior ... not bad, but just not the real stuff. Even in Nepal, shawls and scarves in the pashmina style have been made for years; the cheaper products are made from acrylics, or from regular wool and cotton. Unfortunately, the word "pashmina" has acquired a rather broad generic meaning. In fact, the shawls that are most popular in the West today (and among our own customers!) are woven from a blend of pashmina wool and silk, yet everyone refers to them as "pashmina." What other factors contribute to quality in pashmina or Cashmere shawls? The main factors, of course, are the specific fabric blend, and the style of looming ("hand" or "machine"). A relatively minor cost factor is the dye. We use Swiss dyes to compete the quality. What's with the dimensions of the "full-size" shawls What's up with that? Conventionally, the full-size is supposed to measure 90 X 200 cm., or 35.4" x 78.7"; some weavers go for 90 x 210cm, or 35.4 x 82.7". The natural undyed pashminas ("cream" or "champagne") may correspond to these values, but the cloth shrinks in length by about 4% (roughly 3") during the dying process. These days there has been some attempt to compensate for the shrinkage by increasing the measurements. At the same time, it is very hard to arrive at an objective measurement of such an elastic cloth. Remember that these are supposed to be hand-woven, with some variability in weaving style, loom tension, and so on: naturally there is inconsistency in the precise measurements. Some sellers prefer to advertise the maximum dimensions; others feel safer advertising minimum measurements. We state dimensions that are nearer the minimum -- generally the true measurements are a bit longer.